The Colombo Chief Magistrate today allowed the Criminal Investigations Department to detain former Eastern Province Chief Minister Sivanesathurain Chandrakanthan alias Pillayan till 4 November for further questioning. Pillyan was taken into custody by the CID when he arrived last week to give a statement in connection with the murder of former TNA MP Joseph Pararajasingham. 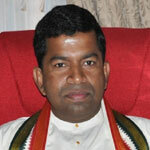 The former MP was was shot and killed in December 2005 at St. Mary’s Cathedral church in Batticaloa.